Every year we make our own migration to the Beech Forest at Provincelands, Cape Cod’s hot spot for migrating warblers. It is practically guaranteed to see over 20 species of warbler in one day, in addition to grosbeaks, tanagers, thrushes, eagles and more. In Winter we cruise to several ponds and along the coast where we enjoy twelve of fifteen waterfowl in Salt Pond, Shiverick’s Pond, and along the coast. May Flowers are in bloom in April along the edges of wooded trails in all our woods. Lady’s Slippers are blooming in the last weeks of May. Recently we have found Small-flowered Gerardia and Wood Anemone in the wetlands at Salt Pond Areas Bird Sanctuaries. We often walk the bike path from Locust St. to the Salt Pond Areas Bird Sanctuary. All along the way there are wildflowers to enjoy, discuss and identify. As the weeks go by the first ones disappear and new ones bloom. We notice the vines that are invasive that grow over the shrubs and trees along the path. The former railroad track transects the marsh into salt and freshwater marsh, and we notice the difference in vegetation in the two areas. In the sanctuary we find different flowers and plants because the soil, the moisture, and the light vary from site to site. As we near the shore, we become aware of wetland plants — sedges, grasses and rushes and other plants that grow only where the soil is saturated. People have always been interested in learning the names of plants. When they become aware of the diversity of the wild plants around them, they enjoy them more than before. Awareness of our natural surroundings enhances our enjoyment of them. We have much to enjoy and much to protect. Other trips during the season will be to spot butterflies and learn to identify some of the more than 70 species found on the Cape. 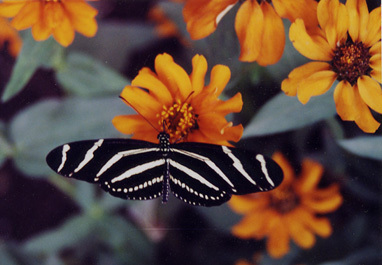 Each species needs a particular plant as a food plant for its caterpillar stage and other plants for its adult stage. We will be learning what wild plants are important to conserve so that butterflies will continue to inhabit our fields and gardens. Not only are butterflies pretty, fragile and intriguing, they are also important pollinators of the plants they feed on. Butterflies are one of the delights of nature that seem to increase in number as you look for them. Their colors, shapes, and flight patterns are in limitless variety. Learn their seasons, habitats, favorite plants and life cycles and you have another reason to be glad to be alive and part of nature’s designs. Butterflies are just as important as bees, wasps, other insects and birds. They and their caterpillar larvae are links in the food chain: caterpillars eat plants, and caterpillars and butterflies are eaten by birds, other insects, and frogs. They also brighten our world, induce us to see and empathize with the fragile and the exquisite. Butterflies were thought by the ancient Greeks to represent the souls of humans. The word psyche was used for both butterfly and soul. Hi We would like to get in touch about touring the ark. We are a group taking a permaculture class interested in creating such structures. We could certainly offer a donation and/or volunteer for several hours in exchange for your time.